Destination Himalayas - Himalayas didn't happen suddenly. I have been planning it for so many years, but somehow it just didn't work out earlier. This year finally on 15th June 2004, I found myself sitting in the train for Delhi. This year I had decided to make it at any cost, so I planned my 2 weeks vacation 2 months in advance and got it sanctioned. Being software professional, it is not that easy to get such a long leave. Again, May wasn't feasible due to some project deadlines, so I booked my place in 15th June batch and kept my fingers crossed. Finally I was leaving for destination Himalayas… We reached Barshani after traveling for three long & tiring days from Pune to Delhi, Delhi to Kullu and then from Kullu to Barshani. The long journey helped all of us to interact quite well with each other and got us in the groove. Barshani has this Parvati valley project under progress. 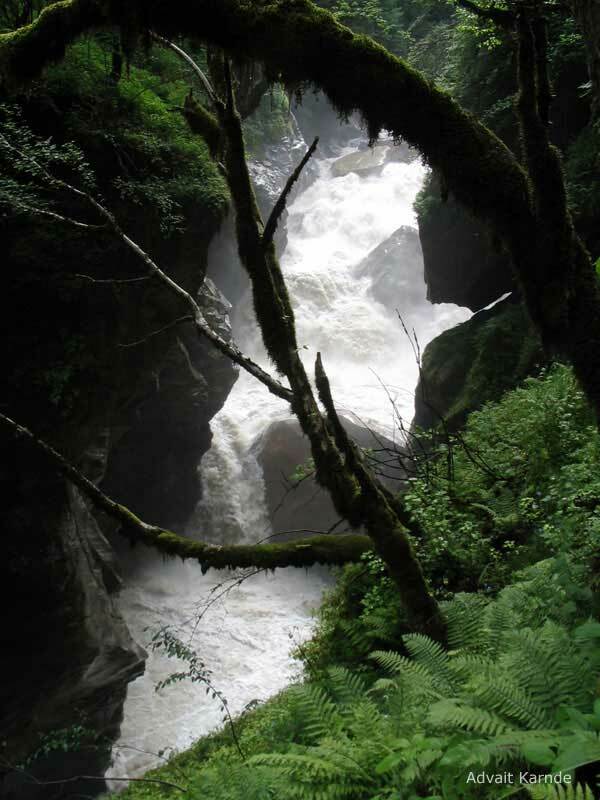 Parvati is the river that charmed us with all its splendor during our entire trek. Our base camp or the starting point 'Kalga' was close to Barshani. Kalga - That was the 0th day and we were fresh, so we took our big sacks on our backs and proceeded for our base camp which was less than a couple of kilometers away. There was one small ascent on this way and that was the first time we realized that it wouldn't be easy climbing these mountains with all this weight on our backs. This was my first trek in the Himalayas, and I was almost panting by the time I reached this base camp at Kalga. Organizers from Zhep had asked us to attend at least few practice treks before this one. But my hectic schedule in Pune didn't allow me to do that; and my preparation was limited to just dumping few clothes in the sack and buying a new pair of hunter shoes. And that was the time I realized that my body badly needed some training. When we reached Kalga base camp, our leaders Amod and Sushrut gave us the necessary information about the trek plan, sleeping bags, and setting up & winding the tent. We dumped our sacks in the tents, had lunch and relaxed there for some time that afternoon. When we got out, I realized how high those mountains were. I have done few treks in Sahyadri, but magnanimous Himalayan mountains are really huge and awesome. Comparing Sahyadri hills with Himalayan mountain range is like comparing Maruti 800 with a Ferrari. The size, shape and formation of Himalayas itself is awe-inspiring and a bit intimidating as well. That evening we had amalgamation walk in the nearby village - Pulga. We kept our sacks in the tent and started out, this walk was a pleasure & we had our first feel of Himalayan hiking. After we came back, our group leaders explained us next day's schedule and told us that if any one of us needed a porter to carry our big sacks, this was the place we should inform them. There were 10 members - Arjun, Adwait, Ajinkya, Radhika, Shivali, Mahajan uncle & aunty, Gowande uncle, Patil aunty and myself; Manish. Four of them were elderly members and they all decided to hire porters for their sacks, besides Shivali decided to do the same. I thought about it; the first climb here with the sack was an eye-opener, but the long amalgamation walk in the evening was a pleasure and I didn't have any problem. The walk conquered any concern that I had during the first climb here, so I decided to carry my sack (weighing around 14 kg) myself; thought I should give my lungs and back a chance to grow stronger! That night at Kalga was fun, our first experience with cold in Himalayas, and trying to get adjusted to the tents and sleeping bags. Mahajan uncle was in our tent and he was a bit uncomfortable with the tent and sleeping bag, it was his first experience as well. But we got adjusted later and had nice sleep in the warm sleeping bags.